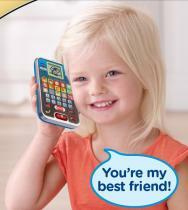 Your child’s first smart phone. Features 15 App buttons plus a special Chat button and a fun, chatty Parrot character who guides you throughout the activities and games. A few of the App buttons, Make a selection from one among five different contacts to name (Mom, Dad, Grandma, Grandpa, Loved one) and have interaction in pretend phone fun. You’ll even input and save their real phone numbers. Make a selection the Chat button and use real voice activation technology to have interaction in an interactive chat with the Parrot. He’s going to ask you questions and respond for your voice inputs. Other Apps teach letters, numbers, and counting. There could also be a Clock App for learning time concepts, a picture gallery, a music mode, and a fun game app. You’ll even Make a selection your personal ringtone. VTech, the author of the Electronic Learning Products (ELP) category, is a world leader in age-appropriate learning toys. Since 1976, VTech has been developing high quality, cutting edge educational products for children from birth to tween. VTech toys deliver smart play throughout the combination of entertaining electronic formats and engaging, age-appropriate content that is helping children be informed whilst having fun.